Carrie Maldonado is president of Today’s Leadership Solutions. As a certified coach, applied behavioral science practitioner, and certified HR professional, Carrie has been recognized as being highly effective in creating management training and leadership development programs for growing organizations. Carrie additionally draws upon the strength of several Organizational Development, Human Resources, Labor Compliance, and Recruiting Professionals to provide holistic solutions to growing organizations who want to provide a world-class working environment and realize record-breaking profitability in their industries. Contact Carrie today for a complimentary consultation. When managers have the right information, and are taught how to apply it effectively, they become unSUEable, unQUITable, UnSTOPable, and UNLIMITED! Gone are the fears of not knowing what you don’t know, gone are the endless complaints about a manager’s communication skills, or management ability, and gone are worries about shrinking profitability. A growing company with well-trained, effective managers is an exciting, fun, and successful place to be. If you are a new or aspiring manager, or a seasoned manager, we will work with you to determine your core competencies and areas for growth and create a development plan that’s in alignment with your goals. With our extensive background in all areas of organizational development, we are able to look at businesses from a unique perspective, and perform a high level analysis of key success areas to determine the best leadership and management program for you, and the training and development that will help you hit your goals. We’ll work with you to understand where you’re hitting it out of the park, and where your risk zones are, and we’ll develop you a blueprint that you can use to get back on track to being the company you were meant to be. We are not in the Band-Aid business! We don’t offer unnecessary training, and we can customize our training for your specific needs. 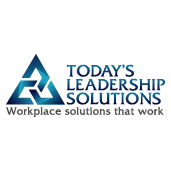 Today’s Leadership Solutions is not for everyone. One of our core beliefs is a premise of Servant Leadership, the foundation of which is the intrinsic and inarguable value of the people who work in an organization. Our leadership and management tools are extremely powerful, and as such, we will only work with companies whom we believe will use them for the betterment of their employees in addition to the financial benefit of the company. This way, everyone wins.